A significant number of young people are registering to vote in Florida, and they could tilt this year's midterm elections in the nation's largest swing state, according to a new analysis of voter registration patterns. The analysis by TargetSmart, a data firm that works on behalf of Democrats, shows that the share of newly registered Florida voters between the ages of 18-29 increased by eight percentage points in the two and a half months after the Valentine's Day mass shooting at Marjory Stoneman Douglas High School in Parkland, Florida. Voters between the ages of 18-29 made up 26.23 percent of all new voter registrations in Florida in the two and a half months before Feb. 14, 2018. In the two and a half months after the shooting, young voters made up 34.22 percent of all new voter registrations in Florida. The eight percentage point gain also shows that young voters are now a bigger share of all new voters. The percentage of new voter registrations from all other age groups in Florida decreased to compensate for the eight-point jump among 18- 29-year-olds. The total number of young people registering to vote also went up. From Dec. 1, 2017, to Feb. 14, 2018, 27,789 18- 29-year-olds registered in Florida, and between Feb. 14 and April 30, 39,218 young people registered, according to TargetSmart. The 11,429 more voters that registered represent a 41 percent increase. The total number of new voters from ages 30 to 49 increased slightly after the shooting, while the total number of new voters from ages 49 and up decreased by 4,240 votes in the three months after the shooting. "A new generation of political leaders emerged in the aftermath of the Parkland tragedy," TargetSmart CEO Tom Bonier said in a statement. 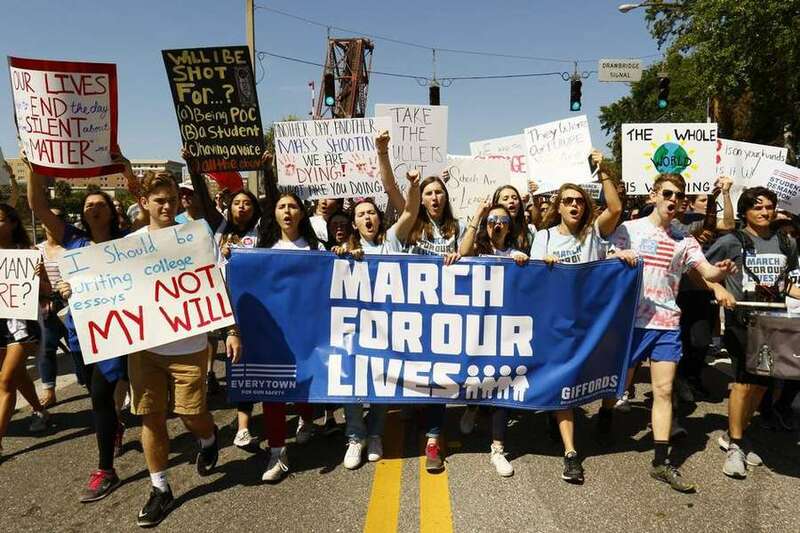 "We witnessed their ability to organize in Florida and across the country as massive crowds took to the streets for the March for Our Lives, and now we're seeing a quantifiable impact from that organizing. It remains to be seen how many of these younger registrants will cast a ballot in November, but they are poised to have a louder voice than ever in these critical midterm elections." The increase in young-voter registration among Florida voters as a percentage of the entire electorate ranks seventh among the 40 states where voter registration has been tracked since February, trailing Pennsylvania, Rhode Island, New York, Virginia, Indiana and Arizona. A host of Marjory Stoneman Douglas High School students, including activists such as David Hogg and Emma Gonzalez, are traveling around the country and encouraging young people to vote. Though their efforts are separate from Democratic campaigns, the activists are encouraging young people to vote for lawmakers who support more gun control, as Congress is unlikely to pass substantial gun-related legislation between now and Election Day. The registration increase comes after billionaire Tom Steyer announced that NextGen America, a group that seeks to elect Democrats to office, would spend at least $3.5 million in Florida on youth organizing while funding staffers on college campuses around the state. NextGen is also supporting Tallahassee mayor Andrew Gillum in the contested Democratic gubernatorial primary. "As the largest eligible voting bloc, young people have the power to make the difference in critical races across the country, and it is clear that they are energized like never before to make their voices heard," said NextGen America executive director Heather Hargreaves. "NextGen America has seen this passion firsthand, and has already registered over 17,000 young people to vote in Florida this year alone." But as Democratic-leaning groups tout a young electorate that could make the difference in races such as the one between incumbent Sen. Bill Nelson and challenger Gov. Rick Scott for a crucial U.S. Senate seat, Florida conservatives have reason to hope they'll remain competitive in statewide elections even though the current environment looks tougher for Republicans nationwide. The National Rifle Association enjoyed a record month of fundraising after the Parkland shooting, Scott has virtually unlimited resources at his disposal to campaign against Nelson, and President Donald Trump has maintained a positive approval rating in Florida even though he has sunk to a net negative rating in other swing states around the country. Hogg, who is touring the nation as part of the March for Our Lives movement, cheered the news of the increase in voter registration in Florida. "The young people will win," he tweeted.